Spring … It’s one of those seasons that seems to wake up a month or so too late. Or surprises you by literally popping the blossoms out. Most years it is a combination of the two. Well, spring 2016 scored top marks for last Sunday’s weather. A fabulous sunny day with only a light breeze here and there, lured invitingly at the West Coast National Park gate at 9am. 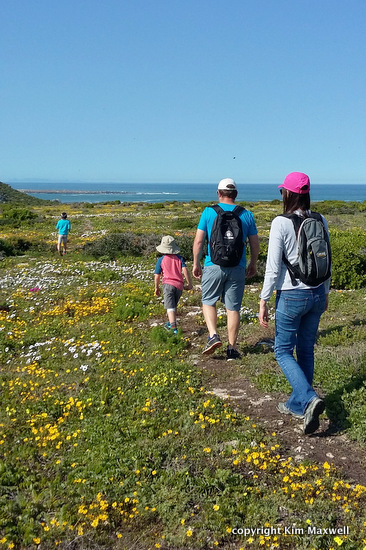 We were there to see the Postberg indigenous flower carpets during the rare August/September period when these private areas of the nature reserve are open to the public. When to go We’d anticipated the queues and a reliable Landy loaded with seven of us left Cape Town just after 7.30am. What a pleasure to leave the park at midday when a 1.5km queue was barely moving outside the gate. Our morning in the nature reserve was fabulous. We drove into the Postberg, parked and climbed a hilly section above the lovely Plankiesbaai beach, surrounded by boulders on one side. There were a few brave swimmers, but mostly people setting up their picnics, simple braais and camp chairs with brandy bottles. Our kids scampered up an easy hilly section that had plenty of yellow, orange and (yay!) 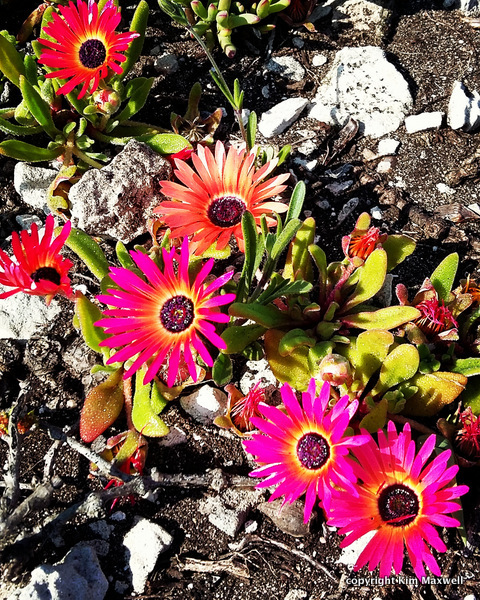 occasional pink daisies. The type that you had to bend over close to photograph. And against the rugged West Coast setting with snatches of blue sea or sky above, quite vivid and lovely. As a bonus, we discovered an ostrich nest. No parent birds to be seen. We’d decided to skip the picnic and do lunch out on the West Coast. But on that coastline there aren’t a lot of options. And Langebaan’s pub-like restaurants are tourist hell, about two decades too late. 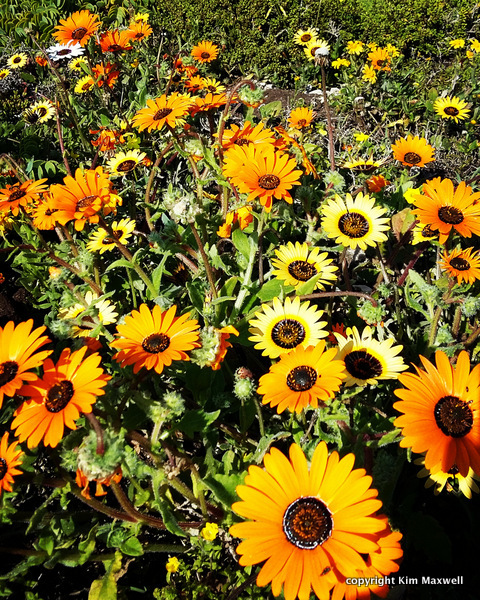 We settled on Hilda’s Kitchen at Groote Post wine farm, accessed via a dirt road off the R27. I looked for a recent commentary and found a 2014 Eat Out review by my writing colleague Greg Landman, describing “always delicious” cooking and chef Debbie McLaughlin’s eleventh year at the restaurant. Two years on, during a Sunday visit on September 2016, I’d say the venue and culinary highlights have not changed much. Why would they? What to eat Off the current menu of about three starters, mains and desserts, we ordered a main Greg had described as “pork belly, slow roasted and served with tangy plum sauce”. Tender and slightly Asian in feel, it was declared delicious. One of our boys requested the signature “old man’s fillet steak roll” (a crumbed chicken burger was the solitary offering for any children in our group, and the crumbed patty seemed to be out of a box). 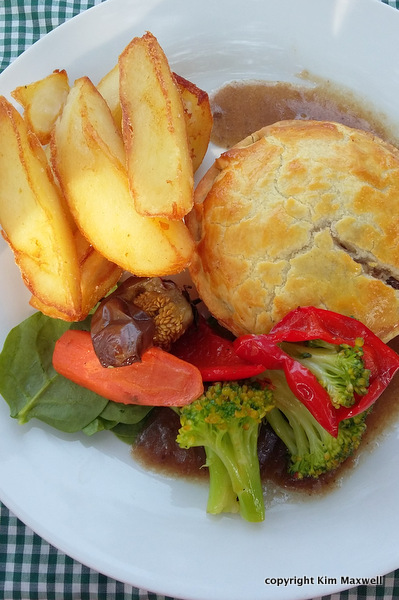 As an adult main, a tasty individual chicken pie containing shredded meat and porcini was served with handcut potato wedges (replacing the menu’s mash) and salad. The lamb main course possibly looked more exciting than it tasted, but our complaint was probably more with the waiter’s description of “medium” than with the fact that it arrived slow-roasted and tender. For starters we tried a salad with beetroot, goat’s cheese and pumpkin seeds. 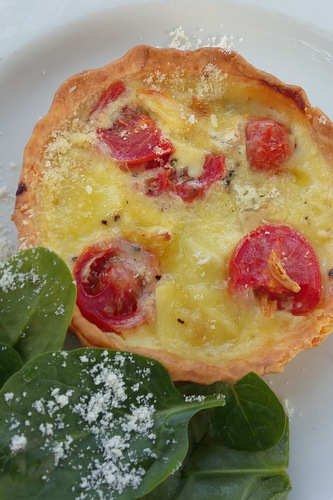 A tasty tomato tart surrounded by a delicate pastry (the other starter sold out) worked a treat with the fresh, guava zing of Groote Post Sauvignon Blanc 2016. Tasty country fare, made to a trusted recipe in the way that country fare usually is. Back to Greg’s “dessert you have to have” white chocolate cheesecake. I can vouch that it was country-size, yet a hungry junior eater polished it off. 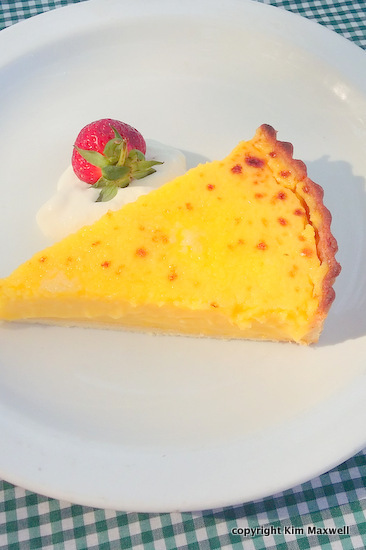 The lemon tarts had a suitably sour tang, encrusted in delicate homemade pastry base. Decent if not the best I’ve ever eaten – but I’m a tough customer when it comes to lemon tarts. In short, pretty decent food. And definitely the best lunch option for kilometres. Just avoid the plunger coffee – it is sluggish and grey. Who to take? Hilda’s Kitchen is in the old thatched manor house on the property. We reserved an outside table under the trees at the back, so the adults could sip wine while the kids ran around and got dirty. And that they did (a slide down an embankment ruined a couple of pairs of shorts, but kept mischievous faces grinning from ear to ear). What to drink Darling beer to quench your thirst, and bottled water too (the farm water is an acquired taste). At R110 the standard Sauvignon Blanc is marked up R30 on the cellar door price. It’s delicious, full of guavas and fun, so a fitting lunchtime partner. In red we tasted the fruity-style Shiraz but ordered a more serious cherry-tinged Pinot Noir 2014 (R235). It may not have made the most sense from a value point of view, but we were enjoying a lovely day in the country and felt like a bit of a splash. How much? You’ll pay about R75 for starters, R50 - R70 for kids’ main courses, R135 - R145 for adult main courses, and about R50 for desserts. Groote Post Vineyards, Darling. Open Wed to Sun for lunch. Groote Post owner Nick Pentz called after my review ran. He says it's not widely known that the farm offers a two-hour game drive through the farm (there are no dangerous predators) for about R200 a head. As they don't have somebody on duty permanently, you need to call the tasting room a day ahead to reserve a place.